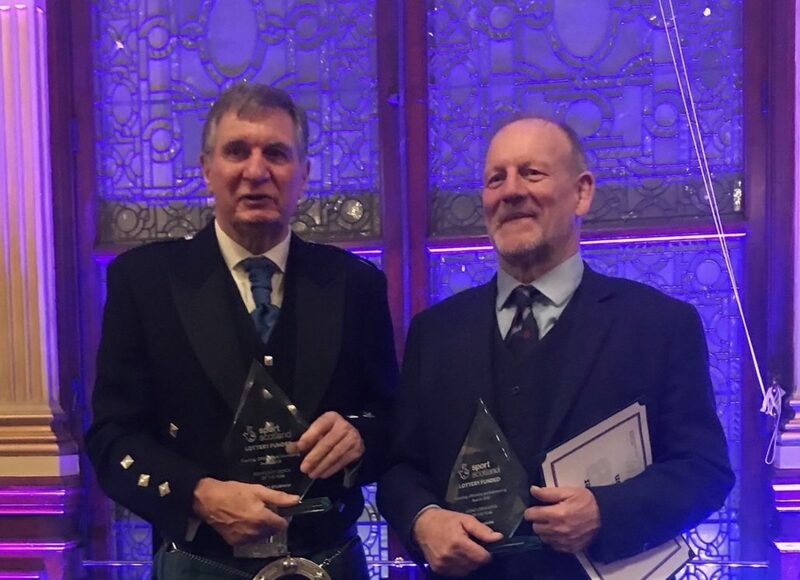 David Sturman and Bob Easson have been recognised for their services to squash at a sportscotland awards ceremony in Glasgow last night (Thursday, November 15). 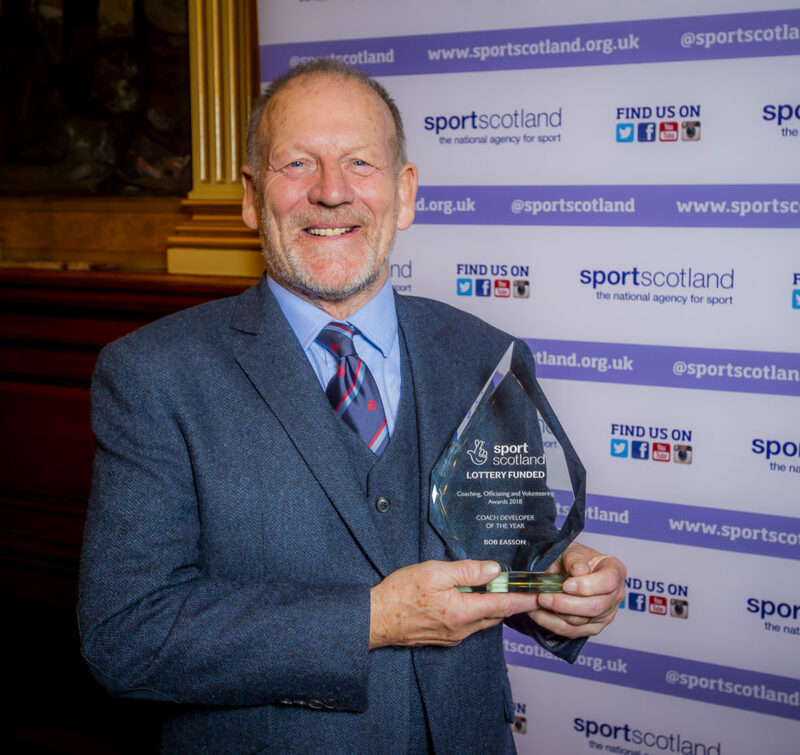 David won the 2018 Community Coach of the Year award with Bob Easson winning the Coach Developer of the Year gong at the sportscotland Coaching Officiating and Volunteer Awards 2018 held in Glasgow’s stunning City Chambers. 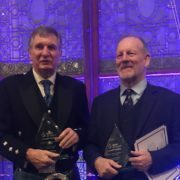 The pair picked up awards on an evening where inspirational coaches, officials and volunteers from all over Scotland were celebrated across 13 categories for their significant contribution to sport over the past 12 months. The ceremony saw leading athletes congratulate the winners and thanking them for their work in supporting and developing sport in Scotland. David Sturman coaches at Scottish Squash Rackets Club (SSRC) in Maryhill, working tirelessly to make sport more inclusive. Among the many sessions and programmes he runs to introduce players young and old to the sport there are many focused on opening the club and the sport up to the BME communities of Glasgow, female participants and local ASN schools. 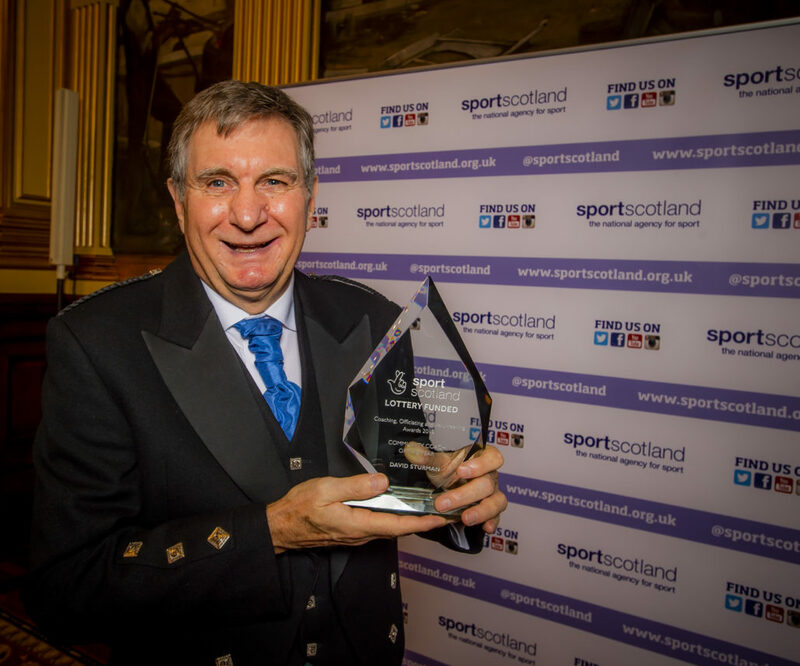 David was an international player himself representing Scotland and this year showed he can still get around the court to good effect when he won the 2018 Over 65’s Scottish National Championship. Notably in David’s two years at SSRC club membership has almost doubled from 80 to 135 members. But his playing career doesn’t detract from his coaching work, David is championing equality in squash and says he wants everyone to have an equal opportunity to try the sport. But what keeps David coming back and giving up so much for the sport? He says his love of squash is such that he can’t keep away. He said: “I love trying to improve players because we need the next generation to come along and if we don’t the sport will miss out on a lot of players. The enthusiasm I get is from working with everyone else. “The Girls Do Squash programme is important because there has been a lack of female players coming through. Slowly but surely the club is starting to change that. He is performance director on the board of Scottish Squash, mentors and helps executives, coaches and players at all levels at Basketball Scotland and is Director of Rugby at Edinburgh Academical Football Club. Despite his wide-ranging remit, what drives Bob remains the same as when he started out as a PE teacher in the mid-60s, the desire to see young people develop. “I’ve been involved in teaching, coaching and mentoring for a long time working with young coaches. The proud moments are seeing someone improve, I get a buzz out of that, to see young coaches get better and move on, those are the proud moments. Stewart Harris, sportscotland Chief Executive, said: “At sportscotland we are implementing a world-class sporting system at every level in Scotland and we can only do so with the support of the many dedicated coaches, officials and volunteers.